Dark and decadently rich chocolate is what can drive a woman to ultimate bliss. The thought of the creamy sweetness of quality chocolate can take some of us nearly over the edge with passion. And I must admit, the selection of imported Guylian Artisanal Belgian Chocolates that I received for this review and giveaway was a very tempting way to seduce this lady. I was sent a giant bar of their Dark Chocolate, Milk Chocolate, assortments of their Belgian Chocolates and Chocolate Truffles. These luxurious chocolates I sampled are sinfully delicious as you savor their smooth, silky taste. They are all made of 100% pure cocoa butter for the best chocolate possible, which I can attest to! I must say you can taste the love in this chocolate created from the original recipe of the married chocolate makers, Guy & Liliane because it does come through with every incredible bite. The Guylian Artisanal Belgian Original Chocolate Truffles 22-Piece Assortment that you can win is almost too beautiful to eat. Each seashell chocolate with a seahorse is a chocolate work of art on its own. However, this is only the beginning of what to look forward to. Once you do stop admiring this selection, you will find a simply irresistible assortment of Belgian dark, milk and white chocolates that will send your pleasure senses into overdrive. Close your eyes and imagine melting one of their marbled white and milk truffles, marbled white and dark truffles, and an extra dark truffle in your mouth for a perfect way to treat yourself. I really think if you want to gain some points with your loved one this Valentine’s Day or any other, then Guylian Artisanal Belgian Chocolates is the way to do it! 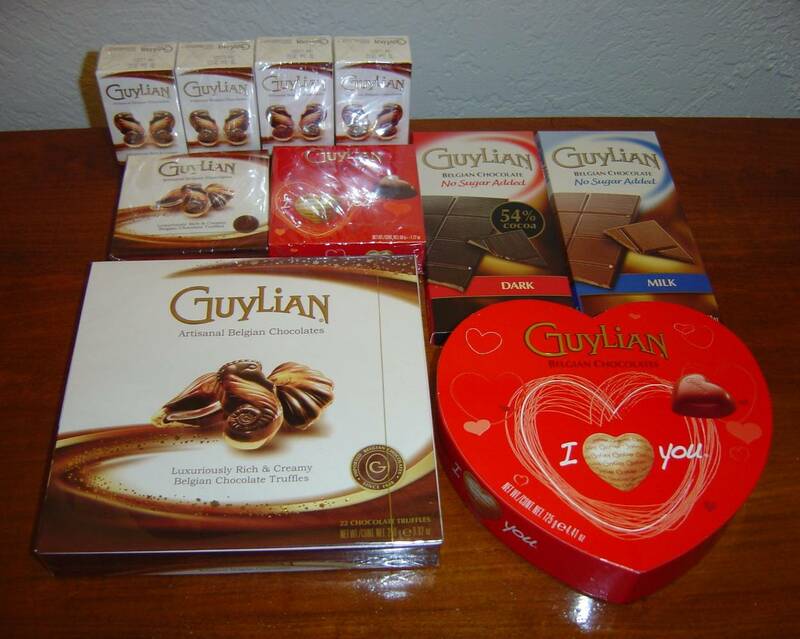 Thanks to Guylian Artisanal Belgian Chocolates, one lucky Nuts 4 Stuff reader in the United States wins a 22-piece assortment of Guylian’s Artisanal Belgian Original Chocolate Truffles ($14 value)! 2. Go to Guylian Artisanal Belgian Chocolates and tell me which product you would love to try first or something you learned from the site in another comment. This giveaway ends February 8, 2012 at 12 PM Eastern Standard Time. The winner will need to respond to my email with name and shipping address within 48-hours or another winner will be picked. Next Post Do You Want to Avoid Buying the Wrong Shade of Blush? I would love to try the Extra Dark Truffles … yum! I'd love to try the Extra Dark Chocolate Truffles! 1. I "Like" Nuts 4 Stuff on Facebook. 2. I "Like" Nuts 4 Stuff on Facebook. 1. I subscribe to the Nuts 4 Stuff blog by email. 2. I subscribe to the Nuts 4 Stuff blog by email. 1. I subscribe to Nuts 4 Stuff in a reader. 2. I subscribe to Nuts 4 Stuff in a reader. I want to try the extra dark truffles. I would love to try the Chocolate Selections. I learned that these chocolates are sold at my local Wal-mart. I follow you on GFC as Emily Davis. I follow on GFC and I'd like to try the Milk Chocolate Bar. Guylian Extra Dark Chocolate Truffles! I would LOVE to try the extra dark truffles! I'd like to try the 22 Piece Classic Truffles. With your first bite, lean back and close your eyes to fully enjoy the moment. Notice how Guylian pure Belgian chocolate melts quickly and smoothly in your mouth. Taste how the dark, white and milk chocolate come together to deliver a euphoric taste experience. The chocolate truffle filling then adds an extra flavor dimension, one that is so rich and so decadent it envelops your every sense. I would love to try the Dark Chocolate Truffle. I have always loved their chocolates. I want to try the Extra Dark! THANKS! I'd like to try the Chocolate Praline Truffles. I would like to try the extra dark truffles! I learned that the company is located in Englewood Cliffs, New Jersey. I tweeted the requested message on Twitter at https://twitter.com/#!/likwan/status/167290283195772930. I would love to get to try the Artisanal Belgian Extra Dark Truffles.